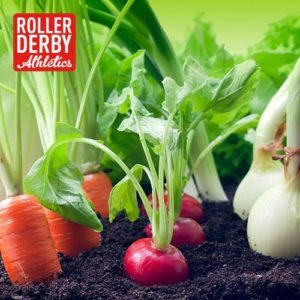 Home / Derby in the Kitchen / Grow Your Fitness (and some Veggies)! Grow Your Fitness (and some Veggies)! Ah, Springtime, when everything starts to grow! As I’ve gotten older, I’ve learned to love gardening. It’s not just the magic of planting something and then, through hard work and a little love, having it turn into something else. It’s that I am cheap. And I like to have control over stuff. And gardening lets me indulge both of those impulses and lets me work up a sweat while I’m at it! Don’t get me wrong, I’m no master gardener. I only choose the easiest possible plants to grow (and no flowers – unless I can eat them, or they keep pests away from my veggies). Why not learn from an incredibly slothful gardener about how you too can grow your own food, but not actually do a lot of work? Take a look at your space – are you in a house, an apartment, a townhouse? What sort or area do you have to plant in – a yard, a balcony, a container near a window? Even the tiniest of apartments can accommodate some type of planting if you’re clever about it. And if you absolutely have no outdoor space in your urban home, you can look at shared community gardens. Once you’ve identified where you’re going to plant, you need to figure out what you’re working with. What’s the climate? How much sun does the area get? What’s the soil like and how does it drain? It’s all well and good to want to grow corn, but if your garden spends the day in the shade, you’re going to have a hard time of it. Once you know what the conditions of your garden space are, you can pick what’s going in the ground. The first year I grew a garden, it was a Spaghetti Garden. Meaning I grew things that could go in spaghetti sauce: tomatoes, green peppers, oregano, and kale. The nice thing about all of these plants is that they are all more or less full sun (which my backyard is full of), and require no special soil, drainage, or care (which is good because I do very little work on my soil). So, you can pick some recipes that you make often and supplement some ingredients. I’m a tomato fiend – my garden will always have multiple tomato plants. This stage will require you to do a bit of research, just to make sure that the plants you want can tolerate the conditions you have. A simple guide is that most veggies that grow on a stalk (corn, beans, peas, tomatoes, peppers, squash, cucumbers) will need mostly full sun. Root vegetables (carrots, beets, onions, radishes, potatoes) will need at least a half-day of sun. Leafy greens can tolerate more shade than other vegetables. Not everyone has a yard to plant in, so containers are a great option. For the best container results, make sure to use a soilless mix or compost instead of soil from the garden – container plants need way better drainage than soil can give you. Try to keep the soil moist, but not water-logged. Also, build climbing trellises for your container plants where possible. Some plants that grow really well in containers are beans, carrots, cucumbers, broccoli, radishes, peppers, lettuce, tomatoes, eggplants, and onions. There are a number of plants that can help each other grow, help keep pests away or enhance the flavour of other plants. This type of gardening is called companion planting. With just a little bit more research, you can end up with better tasting veggies. For example, in my spaghetti garden, the tomatoes were grown in the same bed as the oregano which enhanced the flavour of the tomatoes. My strawberries grow next to my onions (helping to keep aphids off the berries), but I wouldn’t plant beans or potatoes in that bed. Not only will companion planting teach you which plants get along, but also which don’t. Here’s my favourite resource to learning about plant friendship. Pay attention to when all those plant experts say it’s time to plant. Sometimes the old adage of the May 24 weekend is too late, and sometimes it’s too early. You can prepare your beds or containers early by weeding and turning the soil – ideally 12 inches if you can and you can add compost and fertilizer before you even get to planting. On planting day, add 2-3 inches of compost into the soil and work while the soil is moist. Top the beds with more compost to help keep weeds at bay, but be careful to keep compost away from plant stems as this can promote disease. After you get your baby plants in the ground, make sure to give them a good soak. A few days after planting, you can add additional compost, organic matter, or fertilizers like biochar or manure-based fertilizers. You can fertilize every 3-4 weeks for most veggies. If your fertilizer gets on the plant leaves, make sure to knock it off to avoid burn. Work your squat! Instead of hunching, make sure you’re using good squat mechanics for all of your planting and weeding – your back will thank you! Gardening really isn’t that hard. Just plan your plants before you plant them, water them every few days (less if there’s rain), keep an eye on things like pruning (tomatoes need to be suckered, broccoli needs to be shaded, chard and rhubarb need to be picked periodically). Often picking the fruit will help to encourage new growth, so pick things as soon as they are ripe (this will also prevent critters from stealing your hard-earned food). If in September, you find you have tons of produce that you don’t know what to do with – there are lots of options! Chop it up and freeze it, dry it, can it. A well-grown harvest can last you well into winter. 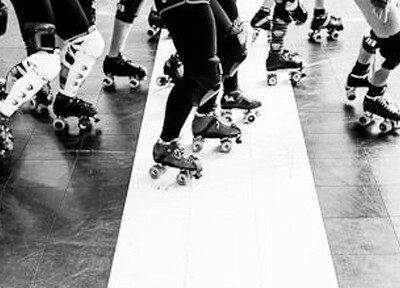 Or – just bring your bounty to derby practice and watch it disappear! How does your garden grow? We’d love to know! I grow tomatoes, corn, and basil, then put it in the food processor, seperate it into 1 gallon containers, and freeze them for winter! It’s delicious! Wow, that’s awesome! I am growing a massive basil plant right now – might need to try that!